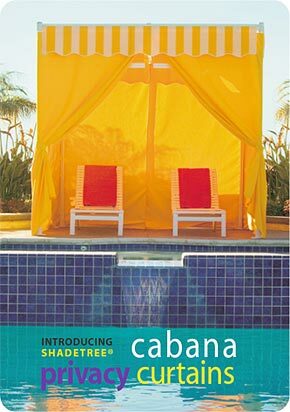 Cabana Curtains turn a hot patio into a fashionable shade oasis. For many people privacy, as well as shade, is an important aspect of outdoor living. Now you can add these retracting cabana curtain panels to any of our ShadeTree® shade models, by simply feeding the stainless-steel roller hooks into the bottom track channel. Or, attach these curtains to virtually any structure using our strip track when no bottom channel is available. Convenient tie-backs are sewn to the panels. Standard length 10 foot. Custom lengths available. fabrics to mix and match with overhead canopies.